All the objectives were met when the Astra active radar homing beyond-visual-range air-to-air missile was test-fired from a Sukhoi in western India. 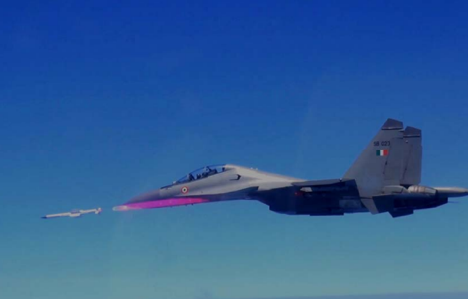 The indigenous Indian Astra missile was successfully test-fired from the Sukhoi Su-30MKI from a naval range in western India, the Defence Research and Development Organisation (DRDO) said in a press release. The Astra is active radar homing beyond-visual-range air-to-air missile developed by DRDO. “The air-launch was captured by side and forward looking high speed cameras and the separation was exactly as per the simulation,” DRDO said. The organisation added that the Astra is India’s first BVR Air‐to‐Air Missile indigenously designed and developed by DRDO, “possessing high Single Shot Kill Probability (SSKP) making it highly reliable.” The missile is an all aspect, all weather missile with active Radar terminal guidance, excellent ECCM features, smokeless propulsion and process improved effectiveness in multi-target scenario making it a highly advanced, state-of-the-art missile, according to DRDO. DRDO added that the missiles underwent rigorous testing on Su-30 in the captive mode for avionics integration and Seeker evaluation in 2013. “The project has thus reached the final stage of testing and evaluation, and the Mk –II variant with higher range capability is also planned to be tested by the end of 2014,” the organisation added. The maximum range of Astra is 110 km in head-on chase and 20 km in tail chase. The missile can be launched from different altitudes - it can cover 110 km when launched from an altitude of 15 km, 44 km when fired from an altitude of eight km and 21 km when the altitude is sea-level, according to the DRDO.